If you were following me on Twitter, you might have already noticed that I was tweeting from my LG Cookie Pep and testing few apps for it. Anyway, last week, I was downloading and testing few best mobile video converters available on the net. After a day of testing, I found that XMedia Recode is the best video converter that can convert videos for almost all mobiles. It has a list of mobile brands and models to select and it will convert the video compatible for that model. Best of it, it is a free software. Once you installed it, click open file and select the video to be converted for your mobile. Then, in â€œProfile,â€ select the brand of your mobile and in the below list, select the model of your mobile. Then, click on the â€œAdd Jobâ€ button in toolbar. 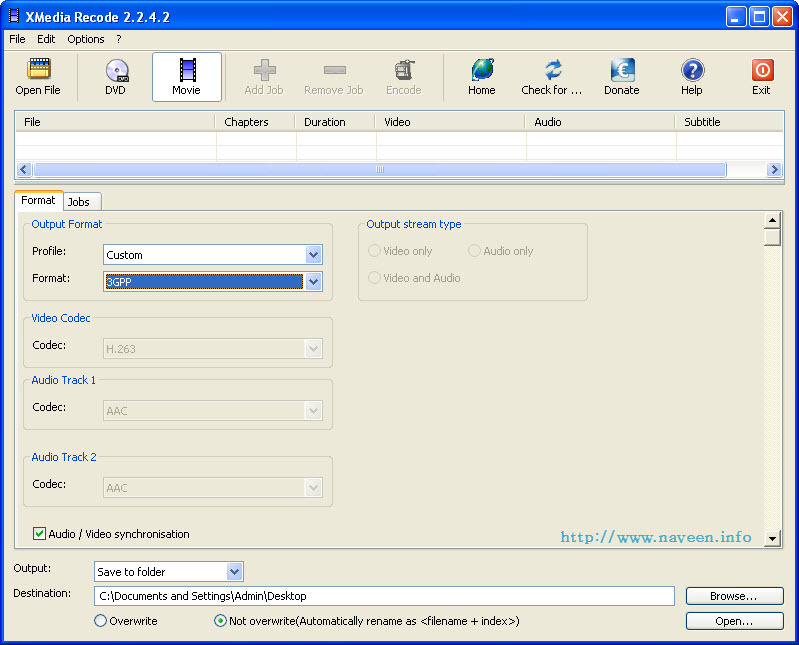 Then, the â€œEncodeâ€ button will active and click it to convert. It also has an option to shut down the system automatically when the conversion completes. You can also use it for normal video conversions. Choose the profile name â€œCustomâ€ and you can see more than 20 types of formats you can convert your video into. It can convert for Acer, Apple, Archos, Asus, BlackBerry, Cowon, Creative, Elson, Epson, Garmin-Asus, Hauppauge, HTC, Hyundai, Intenso, iRiver, LG, Loewe, Motorola, Nikon, Nintendo, Nokia, O2, Palm, Phillips, Pocket PC, Samsung, SanDisk, Sony Ericsson, Sony, Sony PlayStation 3, PSP, Toshiba, T-Mobile, Vodafone, Western Digital TV Box, Xbox, Zune, and YouTube (as of version 2.2.4.2).